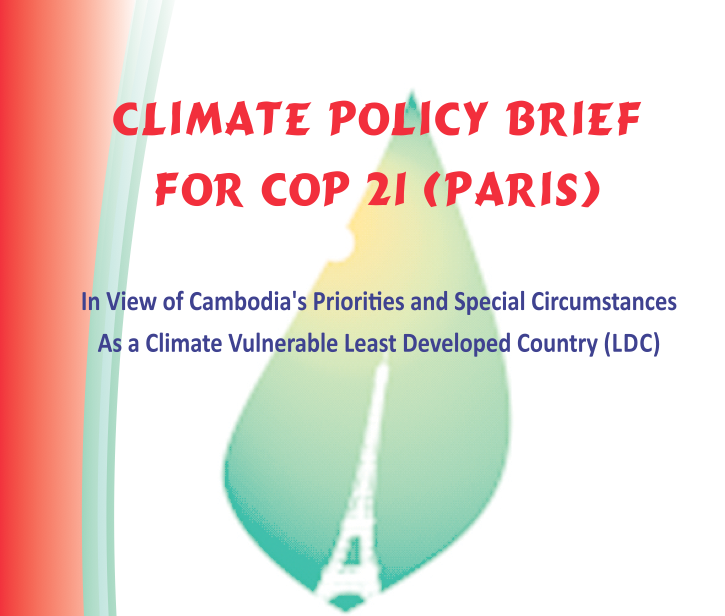 This policy briefing (download available in right-hand column) aims to support Cambodia's position and active participation in the 2015 climate talks leading up to COP21 in Paris. It is written with a view on Cambodia as one of the most climate vulnerable countries in the world, embarking on the positions of the Least Developed Country group (LDC), and having defined its national priorities in the Climate Change Response Strategic Plan (2014-2023), as adopted by the Kingdom of Cambodia in 2013. The briefing describes the current state of negotiations under the United Nations Framework Convention on Climate Change (UNFCCC), that are expected to lead to the adoption of a legally binding post 2020 climate agreement, applicable to all parties, in Paris at COP21. Comparing the current status of negotiations with the priorities of Cambodia, and reflecting the key positions of the LDC group, various scenario and policy options are presented and discussed. The authors conclude with policy recommendations that may help Cambodian stakeholders, inter alia civil society and the government to form positions and engage in the UNFCCC process in a way that leads to the best possible outcome in view of the country's needs and priorities. Additional steps to close the pre-2020 gap, assessed annually by ministerial under Workstream 2 of the UNFCCC Ad Hoc Working Group of the Durban Platform on Enhanced Action (ADP WS2). This policy briefing (download in right-hand column) was written by Thomas Hirsch and Tirthankar Mandal from Climate & Development Advice as part of the DIPECHO project.